According to a study released recently, Houston police officers have used Tasers more on black suspects than any other group of individuals. A Houston city audit found that police officers used Tasers more often on black suspects than on other suspects. Of 1,417 Taser deployments by officers between December 2004 and June 2007, nearly 67 percent were used on black suspects, according to an audit conducted for the city by a team of criminology, statistics and mathematics experts. About 25 percent of Houston’s population is black. Houston police said their use of Tasers was not tied to race, but to a person’s behavior. “It’s not a racial issue. 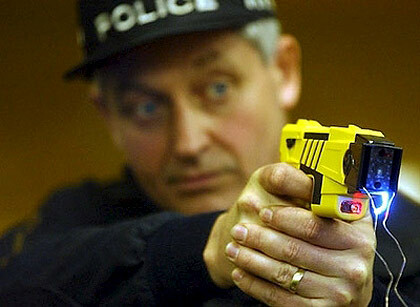 A Taser device is no different from a radar gun. It’s race neutral,” Executive Assistant Police Chief Charles McClelland said after the Houston City Council meeting during which the report was released. The study found that black officers were less likely than white or Hispanic officers to use Tasers on a black suspect. Unfortunately many are quick to judge, be it either a jury decision, or a trigger decision. I might argue that many are quick to judge that this means the officers using the tasers are engaging in racial profiling. The article seems to be guiding readers toward a conclusion that because only 25% of the population is black and 67% of the taser victims were black, then the officers were clearly more prone to use the taser if a suspect was black. Many things need to be controlled for before anyone can draw any conclusions from the facts presented in this article. The article also states that black officers are less likely to use a taser on a black suspect but maybe they are less likely to use a taser on any subject. Now, I don’t mean to defend the Houston Police Department but this article or the report it is based on seem to be biased in their presentation of the data.